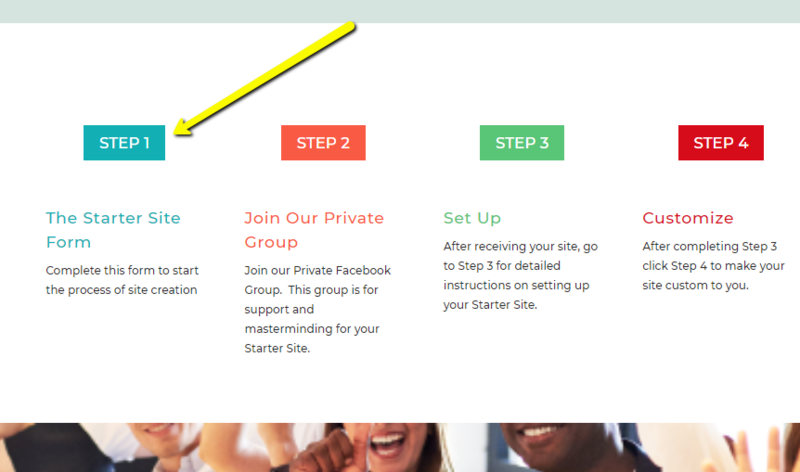 What is a Starter Site? With a Starter Site, you get a beautiful, professional and functional website installed on your own hosting service. Created for you by our graphic designer in a wide selection of color palettes like Farmer’s Market, Organic, Pomegranate and more. Add a little or customize it a lot, your options are virtually unlimited. You can learn more about our Starter Sites here. Where Can I Find the Starter Site Set-Up Form? Once you click on the button, you will be taken to the form. Make sure to fill out all sections that have a required * icon and verify that the form was submitted on the confirmation page. No, we install your Starter Site onto your own c-panel hosting account. If you do not currently have a hosting account, we highly recommend SiteGround, and use them ourselves! Many companies offer different plans. However, in order for us to install your Starter Site, you must have C-panel hosting. Here are our suggestions for some of the more popular hosting companies: SiteGround (Recommended) - Shared Web Hosting - The StartUp plan will work for your Starter Site, but if you plan on adding additional sites or subdomains, you may want to look at the GrowBig or GoGeek plans. BlueHost - Shared Web Hosting - Basic again will work, but look at the Plus or Prime if you plan to expand how many sites or subdomains you have in the near future. HostGator - Their Hatchling plan will work, but look at the Baby or Business plan for additional features. GoDaddy - Web Hosting - You will want the Deluxe plan, look to the Business plan for additional features. What is the Difference Between Hosting and a Domain Name? It can often be confusing when talking about website hosting versus the website domain and this will help to clarify that. A web domain is the URL for the webpage. www.thehealthcoachgroup.com is our domain name. There can be subdomains of a main domain such as our support.thehealthcoachgroup.com. One good analogy is that the domain name is the United States and a the subdomain is a state. Most health coaches will only need the main domain name though. Hosting is what happens when your site is built on a server. The server is “hosting” your site. In very general terms, a website is a series of code that on it’s own, would not be able to be viewed. A server creates the necessary setup for that website to be viewed by those wishing to see it. This is a simplistic description to give an idea of what hosting is. While it adds to convenience, it is not necessary to have your domain and hosting through the same company. Just make sure that you provide details for both when filling out your Starter Site form, or have your domain directed to your hosting servers. As per request, here are some of the favorite free photo sites under the Creative Commons Zero license. This means you can use, modify, and distribute these photographs for free, including commercial purposes, without asking permission. Attribution is not required, however, giving credit and/or linking to where you found the photo is greatly appreciated. Healthie is an all-in-one platform designed for health coaches to a) build their private practices and b) bolster relationships with clients. We have a web and mobile tool for coaches and clients to coordinate scheduling, billing, notetaking, and virtual care. Clients have an app where they can log pictures of their meals, message with their provider, and view documents + course materials you share with them. Your THCG-Healthie account comes pre-loaded with your program materials from The Health Coach Group. You will be able to view them directly with your Healthie account and share them with your clients. IMPORTANT – Healthie is also offering our members exclusive pricing because of this partnership. Healthie hosts weekly group webinars for THCG coaches. Topics will vary by week, but the goal will be to ensure that you are a) comfortable with Healthie and b) learning best practices in the industry. They will send links and calendar invites to you as these get scheduled. Click here to book a one-on-one session here to learn more and walk through your account set up. The wonderful staff at Healthie are available at your convenience to ensure success. I signed up for Healthie awhile ago, I have a Starter Site and just purchased PURE. How do I go about linking all of these so that I have a comprehensive coaching program? If you contact amanda@gethealthie.com or phil@gethealthie.com, they will help to load your program and integrate it with your Starter Site. I already have Healthie, is there a discount with Healthie since I am an inner circle member? If you contact amanda@gethealthie.com or phil@gethealthie.com, they will help get you figured out with your existing account/agreement and the THCG agreement that includes our program delivery for any programs of ours that you own. They have excellent customer service! How Do I Add the Sales Pages to My Starter Site? To add the Program Sales Pages to your Starter Site, you will need to download the files that are found in the specific Program Area in the Members Area. In the sales page import files are an instruction sheet that tell you exactly how to upload the sales pages. After the page is loaded, you will then need to add it to your menu and make any changes you wish to make to them. If you are not wanting to do this on your own or need assistance after attempting it, we offer a VA service or most VA’s with Divi experience would have no issue assisting you. What Should I do with the Terms & Conditions Section of the Sales Page? On the sales pages is a Terms and Conditions section that says the following: This is not something that is required to keep on the sales page but having your refund policy posted is often a good idea. As with any warranty/guarantee, you will want to consult an attorney to determine the wording for your version. The various laws regarding health coaching and business vary from state by state; country by country so asking a local attorney is to your benefit. What we provided above is our standard warranty/guarantee and is provided as an example. If you use it or not, we still recommend that you discuss your options with an attorney. What is the Recommended Price to Sell the Programs for? Do I Need to Be a Member of the Inner Circle to Use THCG Programs on Healthie? Is there any disadvantage to having 4 group start dates on a program? Is there any disadvantage to having 4 group start dates on the Lose Weight – Healthy Habits Page under the Products tab in DSD? Is that too many choices for possible clients? It isn’t too many choices for them, but might be more than what you want to keep straight. Plus, the more people you can have in one group the better. If I cancel my Inner Circle subscription, do I lose my Starter Site? Once we hand over the Starter Site to you, it is yours to keep and maintain. If you cancel your Inner Circle subscription, you will still have the Starter Site. Refunds are not given on active subscriptions unless cancelled within the first 24 hours. If I decide to build this website, it is possible to have my domain connect to it? It is done on your hosting setup so you can use any domain name that you own. Can I purchase (2) Starter Sites? Absolutely! You do need hosting that can accommodate both sites. I am trying To find snippets for my products for my site. Can you please direct me? We have added to each of the resale product tabs on the members site, a participation sales page for you to view and get snippets from. Would a Starter Site be a good fit for me? I'm not good with technology and have never completed my website. We’ve set up the Starter Sites so it’s really easy. There are step by step instructions. You can fill in the blanks yourself or you can have us do it. Click the Button and Submit your Question. We will Answer it and Add it Here. Thanks for your Help!